Donning the official colors of his clan, this piper fills his bag with air and begins skirling with other pipers in uplifting unison at a gathering celebrating Scottish traditions. While some customs are ongoing, Scottish cuisine has recently been elevated from haggis to gourmet meet and vegetable dishes and the kilt is finding its way on the catwalk at nouveau riche fashion shows from New York to Paris. 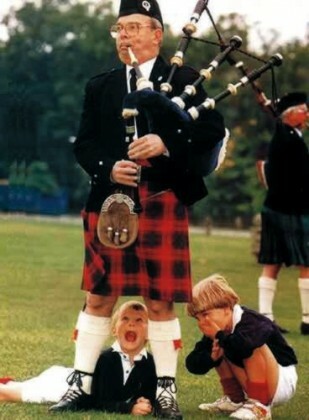 The piper in this photo didn’t miss a beat as his two boys made a concerted effort to distract him. The word is haggis is on the menu for tonight’s dinner.